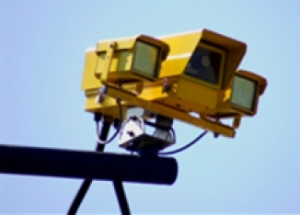 Digital SPECS (Speed Check Services) cameras differ from traditional speed cameras by monitoring a vehicle's average speed over a stretch of road, rather than a spot speed. Pairs of digital cameras can be placed anywhere between 200m and 10km apart, creating 'Speed Control Zones'. Drivers are less likely to brake suddenly for a camera and are more likely to keep their speed down over a longer period. As a vehicle passes the first camera, an infra-red photo is taken and transmitted to the control computer, along with the time the image was taken. As the vehicle passes the second camera, two pictures are taken—an infra-red photo and a colour photo. These are also transmitted to the control computer with the time they were taken. The computer analyses the photos to retrieve the registration number of the vehicle. The computer then compares the time of the two infra-red photos. These are used to calculate the speed of the vehicle between each camera. If the speed is above the threshold, the information (speeds, date and time, vehicle registration, etc) is written to disc which is then checked by enforcement officers.